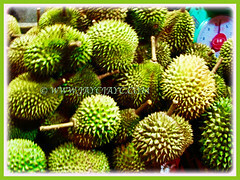 Durian is named the ‘King of Fruits’ in Southeast Asia where it is commonly found and highly regarded by the population with hundreds of cultivars available. 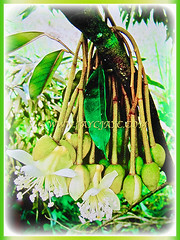 An intriguing and complex tree that produces edible fruits with creamy flesh texture and strong odour that is unique and apparent even when the husk is not broken. Botanical Name: Durio zibethinus (syn. : Durio acuminatissima). 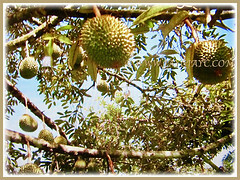 Common Names: Durian, Common Durian, Civet Fruit, Durian Kampong in Malay. 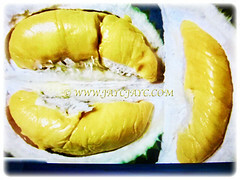 Etymology: The genus Durio is the Malayan name for the durian fruit. The specific epithet zibethinus was created from the Italian word zibetto, which means civet cat. 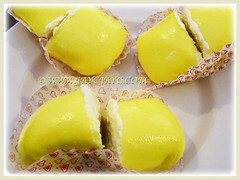 The common name Durian is derived from the Malay language word for duri or spike, a reference to the numerous prickly spikes of the rind, together with the noun-building suffix, -an. Origin: Native to Malaysia, Brunei and Indonesia. 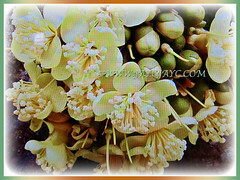 It is widely cultivated throughout Southeast Asia and northern Australia. Features: Durio zibethinus is from the genus Durio that comprises of 30 recognised species. A tall tree with an upright growth habit and a short, straight trunk that’s typically 1.2 m in diameter with rough and peeling bark. The perennial tree with buttressed base grows to a height of 27-40 m. However, cultivated specimen that are usually grafted seldom reach half that height. The large crown is irregular and may range from dense to fairly open with bare branches. 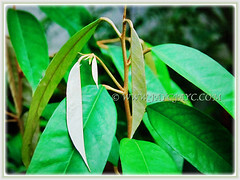 Its branches support simple and oblong evergreen leaves which are 6-25 cm long and 2-9 cm wide. The upper surface of the leaf blade is smooth and glossy green while the lower surface is bronze and fuzzy. These petiolate leaves are a glossy green with a point at the apex and are in an alternate arrangement. It produces 5-7 cm wide showy and bisexual flowers with a bell-shaped calyx, each flower has five sepals and three petals with many frilly stamens and a single stigma. Flowers are coloured white, yellow or golden, blooming a few times yearly and last for a night only. The cauliflorous flowers that are produced directly on large branches in pendant-like clusters of 20-30 flowers bloom at night. They release a strong odour to attract bats which are the main pollinators. The fruits bats also aid in distribution of the seeds. 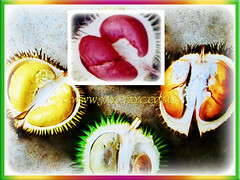 A tough yellow-green to brown semi-woody husk with sharp spines covers the fruit. The irregular ovoid or oblong to round fruits are 15-30 cm long and 12-15 cm wide. It’s not uncommon for the fruits to weigh up to 8 kg though they typically weigh 1-3 kg. Inside the husk, five compartments house the creamy white to pale yellow, golden or orange to red flesh, depending on the cultivars. The odorous fruit has 1-7 seeds within the flesh which are 2-6 cm long. Fruiting occurs once or twice a year with the primary season in May to June. 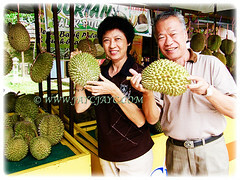 Culture (Care): Durio zibethinus or Durian can be grown easily with least maintenance. Moisture: High to moderate water requirements. It benefits from a high humid environment. Soil: Fertile, loamy, moist and well-drained soils. Others: Once monthly, feed the tree with a balanced granular fertiliser to stimulate growth and fruit production. Generally free from serious pests and diseases. However, vertebrates, herbivores, Phytophthora palmivora, Pseudococcus lilacinus and Drosicha townsendi can be a problem. For subtropical and temperate regions: Hardiness: USDA Zone 11 that is above 4.5°C. Durio zibethinus or Durian is basically an ultra tropical tree that requires a minimum 18°C for fruiting. The trees like an ideal temperature range of 22-32°C, meaning it’s impossible for them to survive anywhere outside the tropics. They must be planted in absolutely frost free regions. Trees will drop their leaves and die should the temperature drop below 7°C. In non-hardy regions, grow this beauty in a greenhouse or conservatory with bright sunshine. Propagation: Easily propagated by seeds that must be planted fresh as they lose their viability very fast and will germinate in about a week. Alternatively, it can be propagated by grafting where grafted trees will begin bearing fruits within 4-5 years. 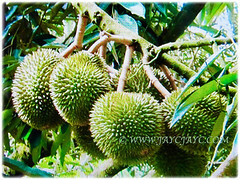 Usage: Durio zibethinus or Durian is popularly grown for its sweet and edible fruits. The flesh surrounding the seeds is mostly eaten fresh. 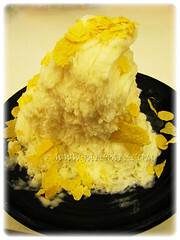 Its sweet flesh can be processed into ice-cream, desserts and candies as well as used for pastries such as durian tarts. The seeds are also edible after boiling, drying and frying or roasting. Young leaves and shoots are occasionally cooked as greens. In Malaysia, the flowers are stir-fried and eaten with chili and soy-sauce. Its flesh is said to serve as a vermifuge, while the leaves and roots are decocted and used as a febrifuge. Juices from the leaves are applied to the head of patients with fever. The leaves are also used in medicinal baths for patients with jaundice. Decoctions of the leaves and fruits are applied to swellings and skin diseases. The wood is used for making light furniture and clogs, as well as to build the interiors of huts and for masts in Malaysia.